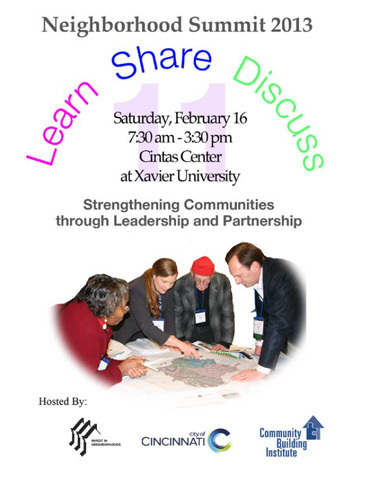 The schedule for the 2013 Neighborhood Summit, to be held February 16 at Xavier University's Cintas Center, has been set. This year's program will focus heavily on implementation of the City's new comprehensive master plan, Plan Cincinnati. Other program elements include an intensive Community Academy track on operating effective community councils, the City's proposed form-based code and neighborhood development, and the encouragement of youth participation in the community building process. Let's Be Clean, Safe, and Strong! Now in its eleventh year, the Neighborhood Summit is hosted by the City of Cincinnati, Invest In Neighborhoods, and Xavier University's Community Building Institute.